(Top -COS, pants- Theyskens Theory, shoes - Maje). 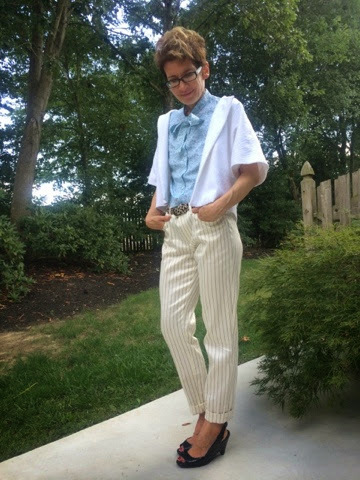 Minimal and clean look; I am really in love with these pants -- they are made of really structured heavy silk, and thus are simultaneously very tailored and very fluid. Also, being short and wide, they are not traditionally flattering, but I do love the way they look, especially with this boxy top in structured cotton. For the longest time, I avoided doing outfit pics. Partly because to me fashion blog means talking about fashion at large; outfit snaps seem to indicate personal style blogs to my eye. Most fashion blogs nowadays seem to be personal style ones, where the main focus is on the pics and not a whole lot of actual analysis going on. This blog tended in the opposite direction: I talk a lot about emerging and/or international designers, about intersection between garment industry and social justice, between fashion and cultural dominance of the West. 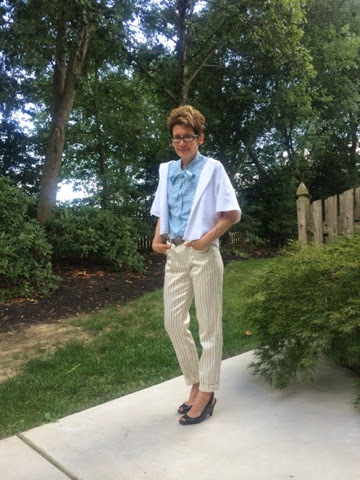 I also talk about sartorial visibility of the other and sartorial invisibility of women over 40; I talk about feminists that curiously seem to share the general contempt toward all things traditionally feminine, including fashion and clothes, with cis straight men. Diluting this with outfit pictures seemed unnecessary until recently. And that brings me to my second reason. Talking about all this is important, sure, but I also started to think that maybe I need to show some of it as well. After all, I am a cultural outsider, an academic, a woman over 40 - all of those not terribly common in the personal style blogosphere. And as I grapple with (in)visibility of all these categories, it seemed fitting to show myself. I don't think that I have any insights or advice to offer when it comes to styling. But I do hope to have a visual record of what I wear on a daily basis. These are mostly work outfits; my wardrobe is a mix of small indie labels, designer stuff from seasons past, vintage, and fairly little high street. This is my backyard, and a lot of the pictures are taken before going to work or after getting home. And these are the clothes in which I negotiate academic and outsider spaces. Putting them here feels a bit strange, a bit vulnerable. And this too is an important reason, perhaps. I decided to start making more regular outfit posts, highlighting pieces by favorite designers. It's a change for this blog, and I will probably try to verbalize some of the reasons for it as (if) I continue. Short version: visibility. Today, I'm wearing a blouse by PRIMEROVA (see the post on Moscow Shopping for details). 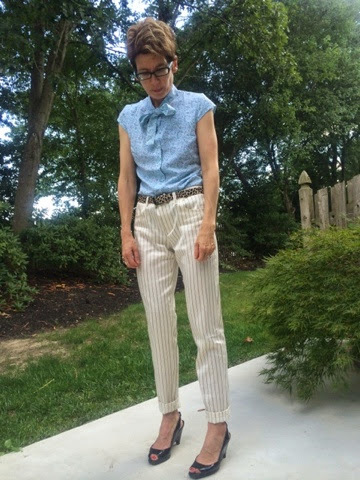 Pants are APC, and the shoes are my trusty Miu Miu slingbacks - they are five years old, and simply don't seem to wear out! The topper is by Emerson Fry, another indie designer that staked out a permanent place in my closet. The belt is vintage Jill Stuart. I've been trying to play with patterns and textures a bit; I like the effect although it is not quite my usual minimal and mostly achromatic aesthetic. I rarely wear makeup in my outfit pictures- this is by design. While I do wear some basic makeup for work (tinted moisturizer, blush, lipstick or tinted balm), in pictures I prefer to look less polished. I am not sure why that is, but I have a sense that it feels less staged this way. Anyway, here're the pics! There was much of outpouring of grief regarding Robin Williams' suicide; there was also much (needed) talk about how people with depression are stigmatized, and how suicide is not a failure but the very tragic outcome of a serious illness. I am glad this conversation is happening, but I cringe every time when someone says "They would never say that about someone who died of cancer", because they would and they DO. We live in the society that has made health a moral obligation, and illness a moral failure (which makes death downright embarrassing, and this is I guess why we cart off our dead in night to funeral homes). We frame talk of disease in terms of fighting a war. We talk about the power of positive thinking. We assign blame. (Oh, you have diabetes? Are you overweight? Oh, you have colon cancer? Were you eating enough fiber? etc etc.) It is bad: if you or someone you love have been diagnosed with a serious illness, most everyone you know will share a personal anecdote about their cousin/friend/friend's cousin who was diagnosed with (some unspecified) cancer and was given six months to live (always six months for some reason), but who prayed/thought positive thoughts/ate macrobiotic diet and was "cured", and then all doctors were amazed and called it a miracle. The story never changes -- even wording is the same. It's the all-penetrating meme that masquerades as a concerned friend offering hope but in reality it is simply another manifestation of the virulent idea that you are responsible for your own health, and if you die of cancer, it is because you were not positive-thinking hard enough. It comes I think from what David Ehrenfeld called "the arrogance of humanism": the persistent belief that humans are in control of their minds, bodies, environment, and therefore we can fix things when they go wrong. Combine it with the libertarian love of "personal responsibility" and boostrapping, so much promoted by the wealthy and other dominant groups. They want everyone to be self-reliant, so that the governments do not have to support the poor and the sick. Poverty and ill-health are a lot alike in some regards: everyone would like the poor and the sick to just go away, or at least have the decency and admit it's their own fault. Meanwhile, of course neither illness nor poverty are ever the fault of the afflicted persons. And of course they overlap a lot. It is amazing how convinced we become by this rhetoric. You can see that in many facets of weight-loss campaigning, the implication being that it is not about aesthetic preferences of the society (it is) but because of concern about fat people's health (it isn't). And it is common knowledge that doctors routinely discriminate against overweight patients (especially women), assigning every illness to their being overweight, and recommending weight-loss as panacea. Those who die from complications of bariatric surgeries are treated as (ultimate irony) obesity-related deaths. And the death of a fat person is a double failure: failure to control flesh and failure to effectively battle illness. No matter what happens to an overweight person will be their fault, and they will be chastised by concern-trolling strangers for every trespass, no matter how small -- eating in public or having the gall to have high blood pressure. So here we are, when every person diagnosed with cancer is "fighting bravely" and often "losing the battle with cancer". Every newly diagnosed will be gently questioned about their life choices to ascertain what was the cause of their illness (and if they were simply too poor to move away from a toxic dump near their birthplace, well that's just too bad). Because people are reluctant to embrace the fact that misfortune -- health-related or financial -- is often random, and might strike anyone at any time. no matter how many servings of vegetables they eat per day. Depression and other mental illness is no different: it is stigmatized, just like most other chronic illnesses, and it is attributed to something the person who has it had done wrong. Admitting the randomness would mean realizing that it could strike us, regardless of how many things we do to guard against it. And this fear, I think, is the ultimate cause of the failure of empathy and humanity that manifests every time someone calls Robin Williams a coward. Death is never a failure, but it is always sad.